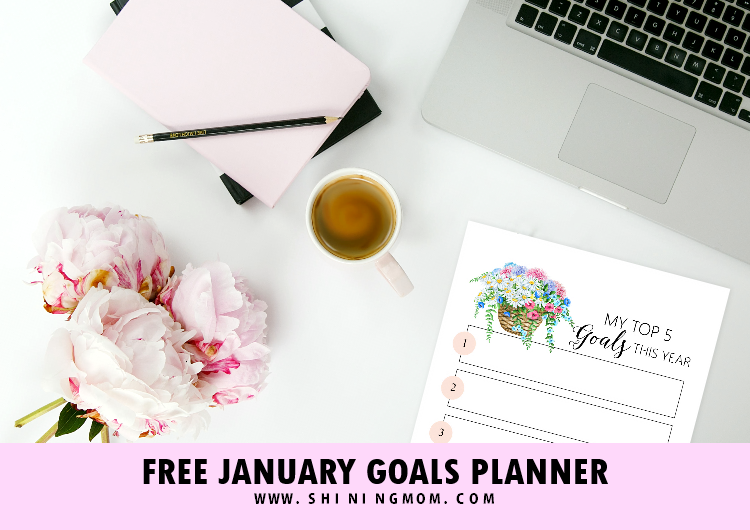 January 2019 Goals Planner: A Brilliant Goal-Setting Planner! Welcome the New Year with clear goals. 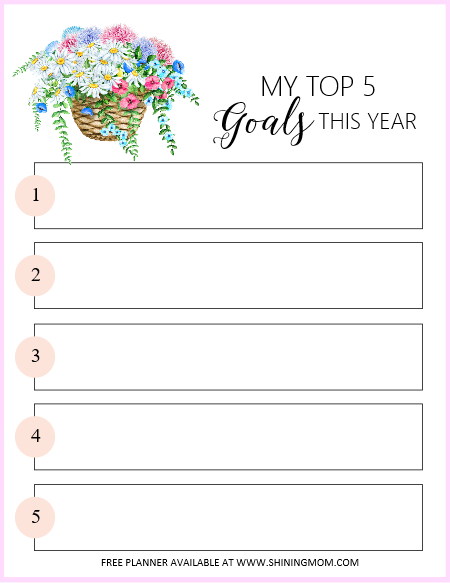 Today on the blog, I am sharing a brilliant 2019 Goals Planner that will help you start the year right. Sit back, relax and write down your plans, now is the perfect time to map out your success! 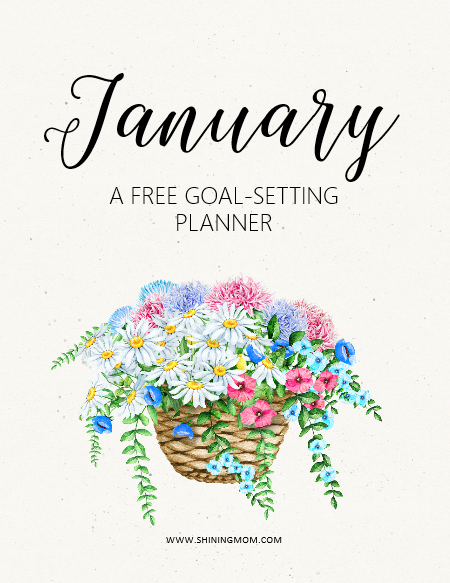 This free January 2019 Goals Planner is a unique planner that will inspire you to be the best version of yourself. Ready to make your 2019 amazing? Ahhh, who’s just as excited as I am to welcome the New Year? Let’s count just a few more days and it’s going to be 2019 already! We will be entering the first month of the year very soon. Are you ready? Let’s get things sorted out together. This free January 2019 Goals Planner will help you step into the year with concrete goals. Because isn’t it that goal-setting is the first step in turning the invisible to visible? January 2019 Goals Planner: Unique. Fresh. Beautiful! Just like you, I have big dreams and goals for this year. And I clearly know that I need to map out my January plans so that when the brand new year is here, I will be very ready. Let’s organize our plan first month of the year 2019. I am happy to present to you my very own January 2019 Goals Planner! Keep scrolling to view the brilliant goal-setting pages included that are sure to help you plan your 2019 success. 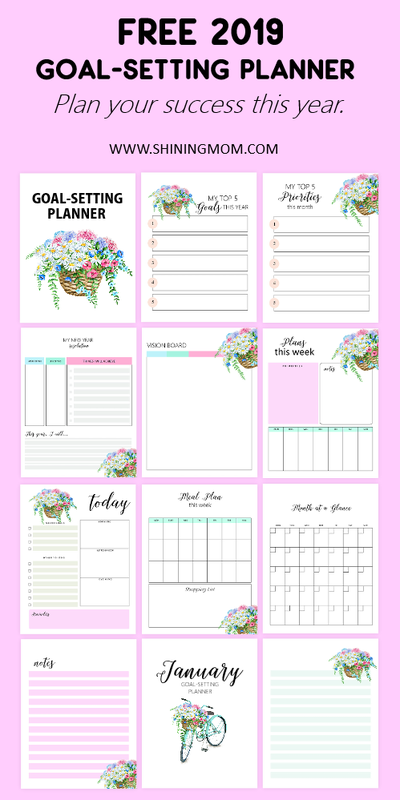 This free goal-setting planner comes in really pretty floral theme designed by Eva Katerina. It’s has unique, fresh, useful and beautiful planning pages. It has 12 free printable pages to enjoy. Let’s dig into the planner! The planner cover is such a pretty page. It’s gorgeous and truly refreshing. Such a great planner cover to use to start the brand new year! Next up are the goal-setting planners. What are you top 5 goals this year? Over a cup of coffee or tea, carefully think about your major targets in the year to come. As for me, it definitely includes skyrocketing the Shining Mom and Home Printables blogs. I am targeting to share more amazing planners and organizers that will bless several of you all over the world! After identifying your yearly goals, it’s time to chunk them down into smaller actionable items. What can you accomplish in January that will make you a step closer to your goals? Write down your top 5 goals to achieve in January because yeas, there’s nothing like starting the year right! You’ll also find pages such as vision board, meal planner, daily planner, weekly planner, month at a glance and more. This planner is ultimately designed to help you set your yearly and monthly goals and to help you identify your monthly priorities, visualize your year, plan your days and more! 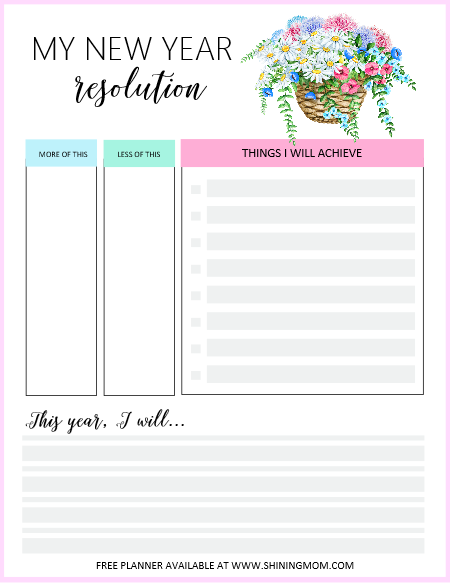 It also includes a New Year’s Resolution worksheet where you can identify the things you should be doing less so you can focus on the necessaries. This page may look simple but really, you can make this work to your advantage! 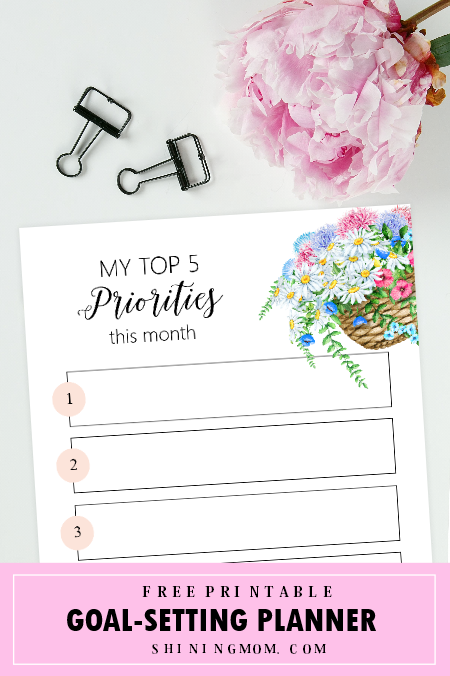 And should you be looking for a complete goal-setting planner, I am happy to announce that I have released a Shining Mom flagship planner over the shop! This new planner will be of great help in keeping your 2019 organized, productive and successful. I highly recommend that you check out the 2019 Success Designer Planner, it will work perfectly with this January 2019 Goals Planner. It’s fully packed with brilliant productivity worksheets that are all goals focused and success driven. The 2019 Success Designer is carefully crafted to help you achieve your dream, one goal and step at a time. 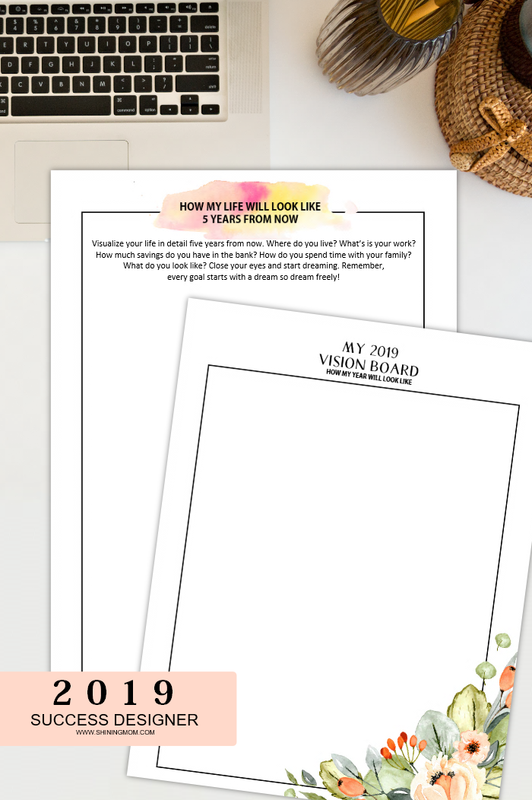 GET YOUR FREE 2019 GOALS PLANNER! 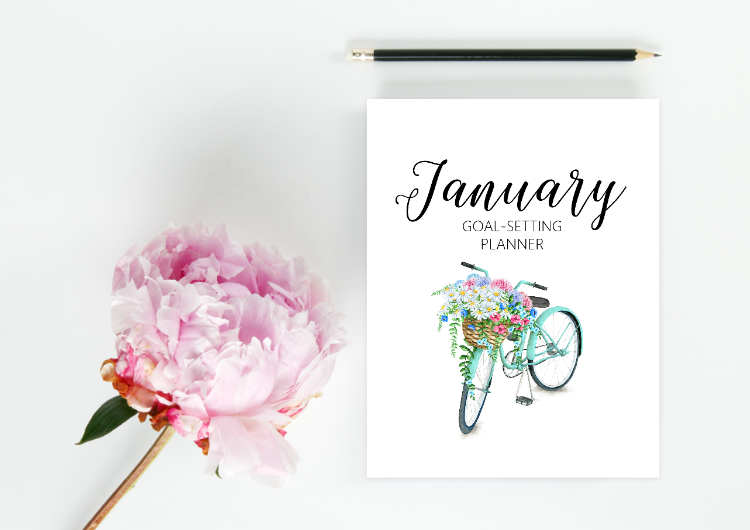 The January 2019 Goals Planner is designed for printing in US standard Letter size paper. Instantly download the printable planner file here. I have more must-print freebies for you! Don’t miss to pop over to the following posts to snag these brilliant calendars, planners and organizers that are ALL for free printing! Design a Life You Love: A 2019 printable planner designed to help you create a life you love. Happy Life Planner: A fun and colorful planner. Editable Calendars: Monthly 2019 calendar that is fillable and editable. January Calendars: 12 beautiful calendars that are unbelievably for FREE! I pray that this January 2019 Goals Planner will bless you in the year to come. « Free Editable Blank Calendar 2019: Colorful Monthly Template! I am soooo excited that I stumbled across your page! I am very over 2018, and excited for 2019 to be here! I have so many plans, goals, and projects to do in 2019, and I was starting to get overwhelmed since our income isn’t always steady. But now I’m feeling more confident with all the free resources you provide that I think your page is going to help me accomplish everything I am set out to do in 2019 plus more (I hope!) on a budget and organized! Thanks, Sarah! Please enjoy the planners! Love this so much! Thank you! But do you have a file that starts with Sundays as I prefer those? Thank you! Yes, I have calendars available that start on a Monday.